The villa, surrounded by tall pines, is surrounded by a beautiful natural environment, in a residential area and has a swimming pool of mt. 15x13 for exclusive use, completely customized, unique in shape and elegance, with minimal environmental impact and with characteristics similar to mountain lakes or exotic beaches. The particular appearance is just one of the characteristics of our pool, as it offers the possibility of a total livability, with the possibility of sitting in the shallow parts, beach effect. Because of its location, the villa is an ideal stay for those wishing to spend their holiday quietly and relaxed. It is located in Avola Antica, a low hill on the Iblei mountains overlooking the sea. Avola is considered the pearl of the Ionian Sea for its beaches of fine sand and the extraordinarily clean crystalline sea. Very close are the most beautiful beaches and seaside resorts of Sicily, Lido di Avola, Lido di Noto, Fontane Bianche, Eloro, Calamosche, Isola Delle Correnti and the natural reserve of Vendicari. Avola is also the land of almond blossoms, famous for its vineyards that produce one of the most prestigious Sicilian wines, called Nero d'Avola. Interesting to visit nearby archaeological sites such as Il Dolmen, the Roman villas, the Tonnara and Marina Vecchia. Cava Grande, natural reserve since 1984 is located only 2 km from the villa, is the most spectacular scenery of the Iblei mountains, where it flows, forming 'Laghetti' called Nache, the limpid river Cassibile, the ancient Cacyparis. And it is precisely in this unique location that our villa was built, with taste and love for nature. It will become the place you will always carry in your heart as it will fulfill all the expectations of your holiday. The villa, with its 2000 square meters of garden with attention to detail, with a large pine forest - palm trees - olive trees - fruit trees - succulents and flowers of all kinds, will allow you to regenerate and enjoy absolute privacy in total relax. You will feel suspended between sky and sea, in a beautiful natural setting. In addition, our villa enjoys a strategic position, as well as a breathtaking view, thanks to the fact that it is one of the few structures with spectacular views of the sea of ​​Avola, from where you can also see the extreme tip of Sicily or the lighthouse of Capo Passero . You will reach in just 10 minutes the beach of AVOLA, 15 minutes for NOTO, 20 minutes for Fontane Bianche and 30 minutes for SIRACUSA. All of these destinations are well-known for their white beaches and crystal clear sea. From Avola you can also reach in just 20 minutes by car THE NATURE RESERVE OF VENDICARI, THE BEACH OF CALAMOSCHE, MARZAMEMI AND SAN LORENZO. The villa is equipped with every comfort, spacious rooms furnished and equipped with taste, 3 double bedrooms, 2 bathrooms complete with shower, kitchen with electric oven, microwave and dishwasher, living room with fireplace and 2 sofa beds, cots from camping for your children. The whole house has an independent air conditioning system. The consumption of water and gas are included in the price; Only electricity has a separate cost that will be calculated based on actual consumption through a specific counter. Bed sheet and towels provided. Possible arrival also midweek. We recommend watching the video inserted between the photos. An additional cost of €. 30.00 will be charged on arrival after 18.00 and €. 50.00 after 20:00. Villa handed down by parents. High affective meaning. I spent unforgettable moments in this villa. It has got a unique view. It is surrounded by greenery and it has a considerable extension of land that surrounds it (2,000 sq m :). In front of the patio there is a well-kept lawn with exotic plants and palm trees and a beautiful private pool. View more about Ino, Alessia e Gaetano. We had a fantastic holiday here, the villa was lovely and very well equipped with air conditioning in each room. The swimming pool was perfect for our three children aged 10, 8 & 3. This has been the first holiday we could truly relax with the children by a swimming pool. The villa is in a great location with Avola only 15mins drive away. It had a lovely beach (Pantanello) and it was here we spent our time when not by the pool as we were very lucky with the weather! In Avola there is plenty of choice for eating out in the evenings and a couple of supermarkets. The owner and his family were very helpful and when we arrived in Sicily they met us in Avola, showed us to a supermarket & waited for us to do our shopping before we followed them up the mountain to the villa. I would definitely recommend this villa and location and we will certainly be returning! We had an excellent week staying at Ignazio's lovely villa. The house is perfect for visiting the south eastern corner of Sicily. Our week was packed with activities - highlights were a couple of visits to beautiful Syracuse, walking in the Cava Grande di Cassibile gorge just five minutes from the house, birdwatching in Vendicari and a couple of other local nature reserves, a trip to Noto, and a visit to the necropolis at Pantalica, which was a bit of a drive but absolutely worth it. The house was ideal for the four of us (two adults and two children). 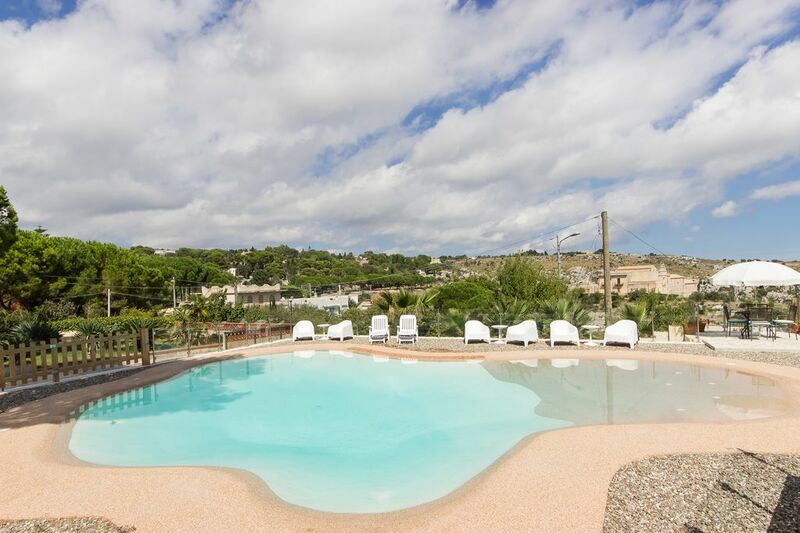 It's beautifully decorated and well equipped, with plenty of space of lots of very welcome practical touches - some lilos for the pool, loads of comfortable seating outside, facilities to wash clothes and hang them to dry etc. We visited in early April and wondered if it was worth having a house with a pool - but although the water was a bit chilly for us, the kids had brought their wetsuits and absolutely loved it. If we'd visited later in the summer we would have made even more use of the lovely outside space, which is beautifully lit in the evenings. The house is quite cool - ideal for summer, but at this time of year, pack jumpers and socks if you don't want to put the heating on! We had a lovely meal at the agriturismo, but otherwise ate in (there's a Lidl just down the road, but the Interspar slightly further away is worth the drive - much nicer!). As others have said, it's essential to have a car here - and you soon get used to the bendy drive up to the house - we found it took about 15 minutes down to the main road. Thanks for a lovely holiday, and we would definitely recommend the house to anyone looking to stay in this area. Cara Catherina, é stato un piacere averti ospite nella nostra villa. Siete stati gentili, ordinati e puliti. Consigliamo vivamente agli altri proprietari la tua famiglia. This is one of the nicest places we have ever stayed! We stayed here in April 2017. The pool and garden is great for young children, and they loved it. Bedrooms are comfortable and everything was provided. The entire house is very clean and the kitchen is well equipped though only a small oven - which we didn't use as we tended to eat out. There is a really nice outdoor terrace too. The view if great but you do have a long (but nice) drive up the mountain and while it's a very secure and private place there are no conveniences to walk to, though we had an amazing meal at Turismo Rurale Avola Antica a 5 minute drive away. It's a good base for Noto, Syracuse, the Cava Grande, Vendicari and Modica and the drive to Akrai was one of my favourite trips. We saw plenty of the owner Ignazio so if you have a problem he is around. We don't speak Italian but we managed OK, though I think we had a few mix ups but that's to be expected. We stayed here for a week in July. The villa is well laid out with good facilities - everything you need. The owner was helpful and welcoming. What made the place really special was the outdoor area, including a large shady terrace, beautiful landscaped gardens and the most amazing pool. We had planned to do lots of sight seeing but we loved the villa and spent much of our holiday here. The pool has a shallow 'beach' area but it is also big enough and deep enough to swim in and it provided the perfect way to keep cool in the hot Sicilian summer. The road from Avola to the villa winds up the hillside with some sharp bends with stunning views all the way up. It is well worth the trip. The roads near the villa are a bit narrower but we had no problem with our medium sized hire car (a VW Touran). There are no shops in the village but there are plenty of shops in Avola and we found everything we wanted. Avola is a good base for visiting this part of Sicily with Syracuse, Noto and Modica all in easy reach. Avola has sandy beaches and the sea is crystal clear - bring your snorkel and mask! In all these places there are good restaurants, particularly if, like us, you enjoy fresh fish and seafood. We had the holiday of a lifetime here and we would highly recommend it. 2 km from the reserve of Cava Grande Cassibile with its famous lakes. 6 Km Avola with its beautiful sandy beaches and crystal clear water. To taste its famous products: Nero d'Avola wine and almond pizzuta for the preparation of delicious sweets and granite. A 6 km from Avola is Noto, a small Baroque jewel and 15 minutes from Siracusa Avola, famous for its Greek culture, with numerous archaeological sites like the Greek Theater, the Ear of Dionysius, La Cave Cordari. Also the Ortigia's Island in just one square kilometer contains Greeks Temples, Palaces Swabians, Aragonese and Barocchi and Arab streets. Not far from the Reserve Vendicari. At 80 Km there Catania, on the slopes of Etna, the highest active volcano in Europe and near Taormina, Noto, Siracusa, Modica beautiful Cities. Tutti i consumi sono inclusi nel prezzo eccetto il costo energia elettrica che verrà calcolata in base al reale consumo dei nostri ospiti mediante contatore. Consegna delle chiavi da parte del proprietario. Pulizie finali: 80 euro. Cauzione: 200 euro. Si fa presente che per il check-in oltre le ore 18,00 verrà applicato un costo aggiuntivo di €. 30,00. Per il check-in oltre le ore 20,00 verrà applicato un costo aggiuntivo di €. 50,00.